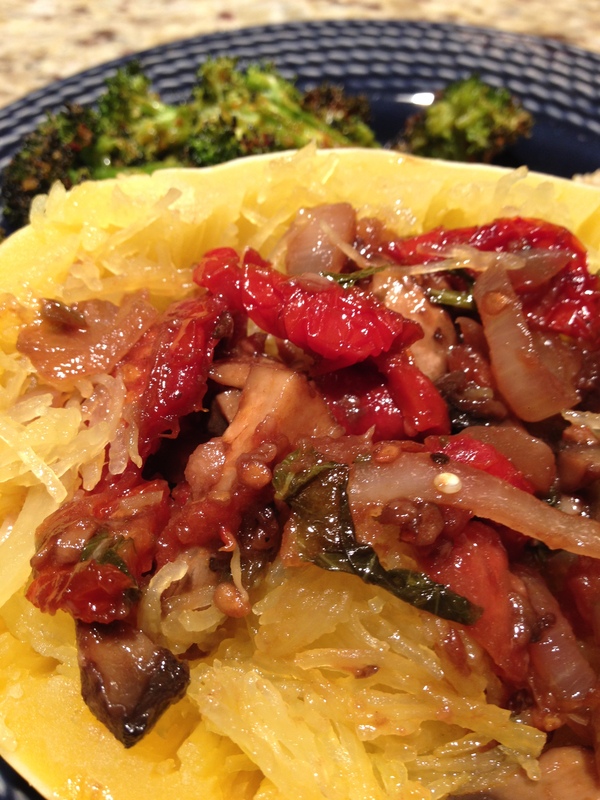 Growing up, I was never a real fan of spaghetti squash. My grandmother used to make it often, preparing it simply with salt and serving it as a side dish. But as my palette expanded, so did my imagination of how to showcase this actually tasty, and healthy, winter squash. By using it as a replacement for traditional spaghetti noodles, you can top it with any sauce of your liking. My personal favorites are tomato-based. And another bonus…. the tough skin of the squash can act as individual “bowls” to serve your guests! Preheat the oven to 375 degrees. 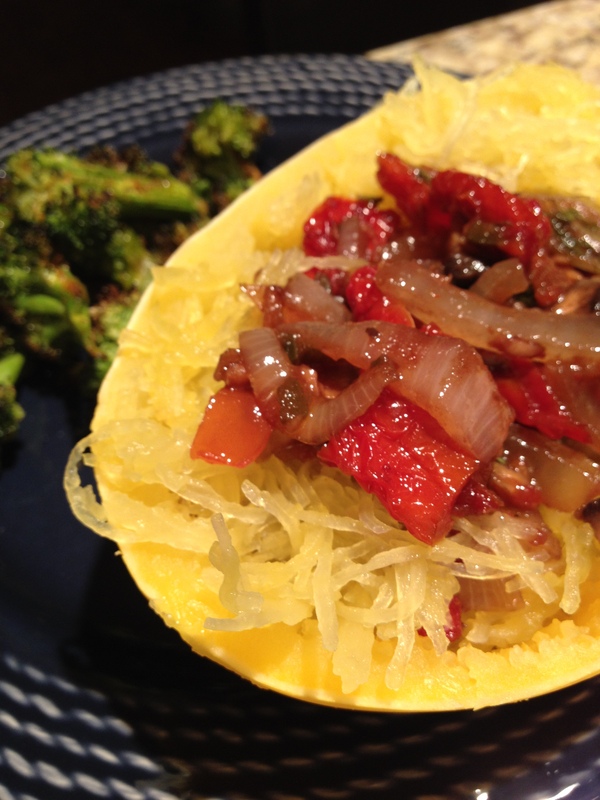 Slice the Spaghetti Squash in half, length wise. 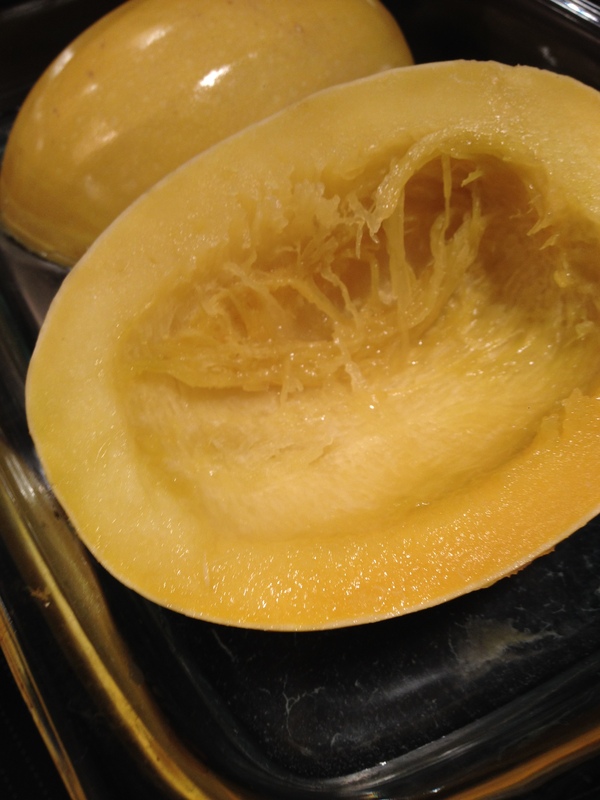 Scrape out the seeds and place the squash skin up in a glass baking dish with a half inch of water. Bake for 40 minutes. The flesh will string apart with a fork when done. While the squash is cooking, sauté the onion in a sauce pan on medium heat with the olive oil. When it starts to turn translucent, add the sun dried tomatoes, fresh tomato and garlic. Let simmer for 5 minutes and then add the red wine and balsamic. 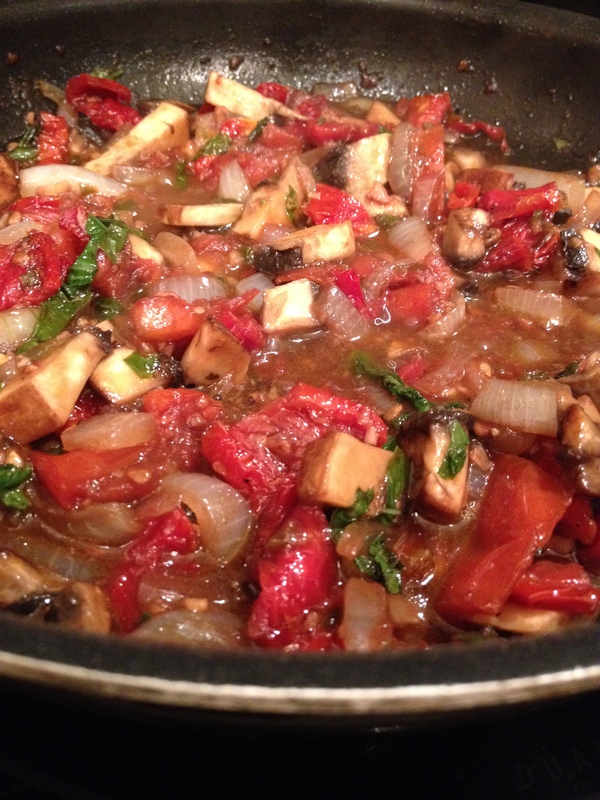 Let the mixture continue to simmer for another 10 minutes and then add the portobello mushrooms and fresh basil. When the squash is done cooking, use a fork to string the flesh into “spaghetti” strings. Salt the squash, keeping it in skin of the squash – they become individual “bowls”! Top each half of the squash with the sauce and serve hot. Add fresh shaved parmesan and serve along side grilled chicken, baked broccoli and a caesar salad.